Brussels sprouts are one of my favorite vegetables. They are part of the cruciferous vegetable family. Brussels sprouts contain antioxidants and play a role in preventing inflammation in our body. 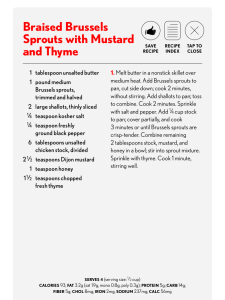 They are an excellent source of Vitamin C and K.
When my November issue of Cooking Light arrived, I could not wait to try many of the different recipes, but the first one I had to attempt was Braised Brussels Sprouts with Mustard and Thyme. They turned out delicious and there are 3 other varieties of the recipe included in the magazine. Here is a link to the recipe online. 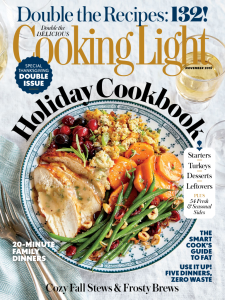 Recipe and images are from Cooking Light’s November 2015 issue.